Austin College trustees enjoyed a taste of Texoma during the fall 2014 Board of Trustees meeting. To acknowledge the power of local partnerships, the board met for Friday night dinner in downtown Sherman at Fulbelli’s Restaurant in Kelly Square—a historic building restored by senior trustees Robert ’60 and Honey Altman Minshew ’63 of Sherman. Local community leaders joined the board to talk about the impact Austin College is making in the region—from volunteer manpower to student grant writing and local internships. “Global Vision, Local Engagement” is one of four pillars of Austin College’s recently adopted strategic plan, Adding Value to a Changing World: 2015-2020. A foundational piece of the College’s local engagement is its nationally recognized Social Entrepreneurship for Poverty Alleviation (SEPA) program. 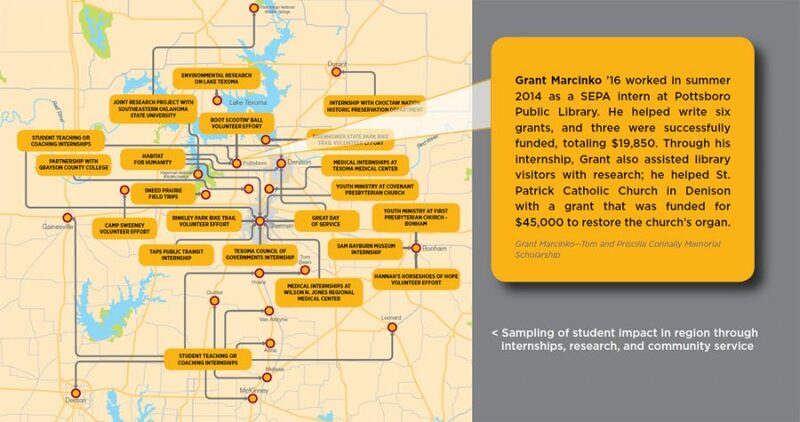 SEPA is a collaborative effort with the Texoma Council of Governments and U.S. Government Grants, designed to provide grant-writing internships for Austin College students placed with local nonprofit organizations (NPOs). In summer 2014, SEPA student/NPO teams submitted 42 proposals; to date, 14 have netted $113,650 in new funds for the region. The SEPA project, along with initiatives in regional innovation, collaboration, and facilitation, will build new bridges between the College and its home community—while accelerating the cultural and economic growth of the surrounding region. If the success of SEPA is any indication, the partnership between College and community will have a bright and successful future.